Way Way Way back in the day I was soooo excited about DC vs MOTU. I hear a lot of fans talking about the art being inconsistent. I noticed a few things myself. Teela’s armor is different. Sometimes it looks like her “battleground Teela” skimpy clothes. Sometimes it looks more like Man-At-Arms armor, femaled up. Roboto is another one that is inconsistent. The covers list a barrage of artists. This is one reason for the inconsistency. The jawless, hulking version of Skeletor. Queen Marlena is back on Earth! The age old question, answered. “If He-Man and Superman were to get into a fight, who would win?” Apparently He-Man. How come The Death of Superman wasn’t more pronounced in the larger DC Universe? Why no books spent on a funeral or mourning the loss of Earth’s greatest hero? Why no replacement clones or cyborgs? If DC were serious about He-Man having killed Superman…even if it only seemed to be so, wouldn’t they have created more hype? Batman lets just about anyone into the Batcave, doesn’t he? And the House of Mysteries? That’s pretty easy to find too, apparently. Does this story ignore Forever Evil? In fact, the last line of Issue 1 says “Crisis on Whatever Earth This Turns Out to Be.” So is it Prime-Earth? Cyborg looks like his old self? The Joker appears in the last panel of issue 5. Yes mesmerized. But still. His face is stapled on his head…??? Skeletor uses mind control magic on the Justice League in issue 2. Then in issues 5 and 6, Dark Orko uses mind control on them. They seem to have a susceptibility here…shouldn’t they do something about that? Counldn’t Constantine shield them permanently or something? As early as issue 4 Skeletor seems ready to do a 180-degree turn on Dark Orko…at the prodding of Black Alice. Why was he so attracted to Black Alice anyway? Aren’t there more powerful mages on Earth? When Dark Orko calls all of those meta-humans, Orion is one of those, as well as Wonder Woman. We have seen what happens when these two get together. Shouldn’t the level of catastrophe been higher? Dark Orko deconstructs Skeletor again, before they are transported away “FOREVER.” (We know they’ll be back.) So what happens to Skeletor now? 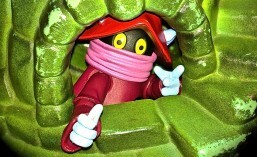 He seemed to think he could grab Horde Prime’s power somehow from Dark Orko. Was he successful? Apparently Constantine, or at least one of the Justice League Dark can leave earth and go to Eternia at any time. SpartanNerd’s rating 3/5. Not an outstanding Justice League or Masters of the Universe story. (An outstanding Justice League story…try Forever Evil.. An outstanding Masters story, try “The Origin of Hordak.) It has inconsistent, but generally good art. 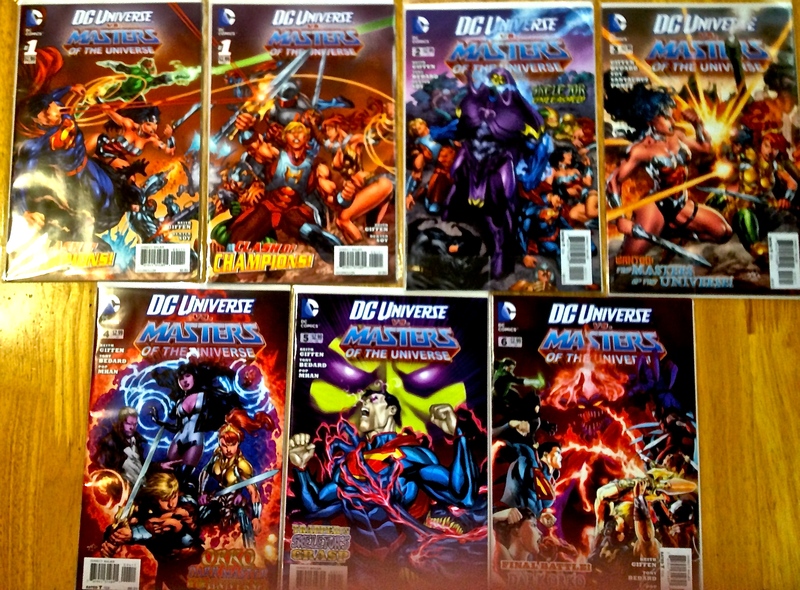 Loose connections to the larger DC New 52 continuity. I’m sure it was a challenge to represent all three factions of the Justice League AND the Masters of the Universe. But the characters should be truer to themselves. Wonder Woman should have been ready to kill everyone, for instance, after Superman was “murdered”. On the other hand, we find the beloved character of Marlena alive and well. Eternia is a part of the New 52 universe, and we are introduced to Dark Orko, who isn’t as bad as people made him out to be considering. I mean, at least he can probably be brought back to his regular form. The character is salvageable now. And that is a good thing. ***James Eatock answered my question! Here is his answer, cut and pasted from FaceBook Messenger! Many thanks to James, and I am sooooo honored! This entry was posted in Comics, CROSSOVER, Dark Orko, DC Comics New 52, DC Universe VS. Masters of the Universe, He-Man, He-Man and the Masters of the Universe, Masters of the Universe, MOTU, MOTUC, SpartanNerd Review. Bookmark the permalink.